Today I learned… how to remove unwanted characters like â€ and Á from WordPress post content using a MySQL query. Backstory: I recently migrated a blog from shared hosting to a VPS. This experience alone could fuel TILCode content into 2024, but this particular “TIL” article is about a curious character encoding artifact that occurred as I exported the WordPress MySQL data and imported it elsewhere: Á and â€ symbols everywhere! 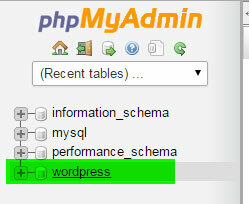 Removing these unwanted symbols from my WordPress posts required running a few queries on my MySQL databases. Here are the steps I used. Click on the “PhpMyAdmin” logo so that you’re at the “root” level (and not inside a database – this might work from inside a database, but I did it from outside). Here, you’ll get a large window in which you can type queries – operations you perform on your data. The first query to run is one that will set the character encoding type. I learned this from JesseWeb’s helpful tutorial on resolving WordPress character issues, but his code didn’t work for me as-is (I suppose that’s not surprising considering his guide is nearly 5 years old). I had to remove the quotes from the database name. Your query will look like the image below. Be sure to replace your_db_name_here with your database’s actual name (look in the left column for your db names). Click the “Go” button on the right to run the query. For this query, you need to navigate to the actual database itself. Click on its name on the left. Click on the SQL tab. Now the helper text says that queries are run on the database you selected. See shadez’s question on WordPress.org for more examples – his example was instrumental in helping me understand this issue. And with that, all the unwanted characters are gone. Phew! Thanks Mandi. Some of the unwanter charters were removed, but some are still there on my website. I will try once more step by step.